Let your worries and tension slip away as you soak in a warm bath filled with our Foaming Bath Salts. Foaming Bath Salts are Infused with a special blend of vitamins and plant extracts which will nourish and condition your skin. The foam in the salts is activated by Lathanol, a mild surfactant that cleanses while creating an intense bubble bath. You simply pour the foaming bath salts into warm running water to produce a lush foam bath. Our special foaming formula helps to capture warmth in the bath water, making your bathing escape last longer than a typical bath. Our Foaming Bath Salts are enriched with Aloe Vera Leaf Extract ,Vitamins A, C and E and Pro-Vitamin B-5, which will nourish and condition your skin leaving it soft and silky smooth. The traditional benefits of bathing in Natural Sea Salts combined with bubbles and enhanced with vitamins makes for an amazing bathing experience. Simply add scent directly to salts and mix. Color may also be added directly to salts. Colorant is available here. Who wouldn't want to soak in a warm bubble bath scented with Coconut Lime Verbena? How about the scent of Sweet Milk or the relaxation of Lavender & Rosemary E.O? The possibilities are endless, really, we can go on forever so take a look at the Fragrances & Essential Oils available for purchase. For full grain description and chemical analysis of salts click here. 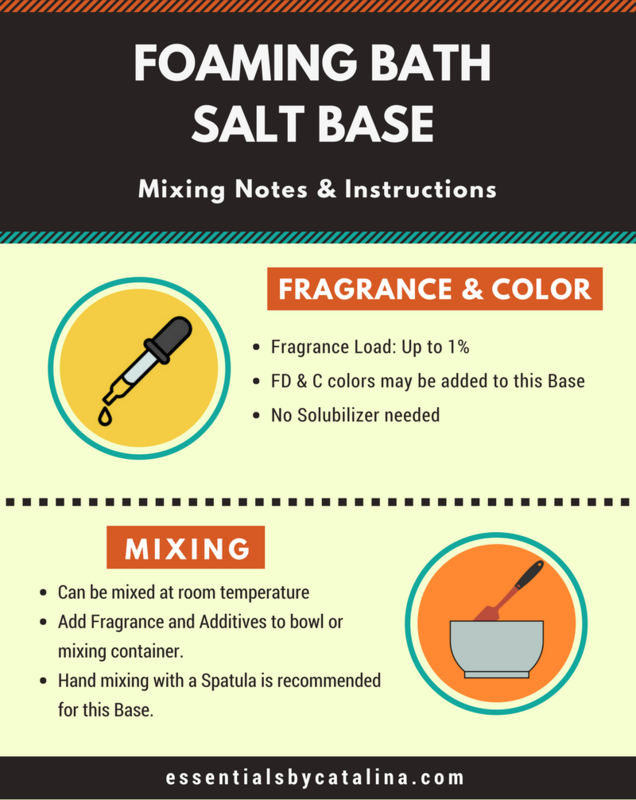 * Please note: Due to the reactive nature of salt, scented/colored sea salts should be used within several months of purchase to avoid discoloration or fading of Color and Scent. Sodium Chloride, Lathanol, Aloe Barbadensis (Aloe Vera) Leaf Extract, Panthenol (Pro-Vitamin B5), Tocopheryl Acetate (Vitamin E Acetate), Retinyl Palmitate (Vitamin A Palmitate), Ascorbyl Palmitate (Vitamin C Palmitate), Fragrance, Colorant if applicable. Great product and the bubbles last 2 hours. I love that EBC will add the fragrance for you. Love this product. Only 2 oz net wt is all that is needed for a long lasting, luxurious bubble bath. This was my first purchase of Foaming Bath Salts from EBC. I am so very happy with this product. I can't wait until my craft fair!! YEAH!! Love this product, makes your skin feel so smooth and the bubbles last.